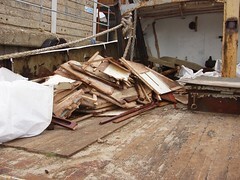 I've got the bulk of the wood cleared from the stern accommodation. Now all that is left is to strip is the remainder of the ceiling. I'll keep the smelly old decking until I've got the rest of the metal cleaned and insulated, as it provides a sturdy, safe, platform to work from. I'm a little surprised at the volume of wood I've taken out, it's an exercise in itself just to clear the wood from the deck. 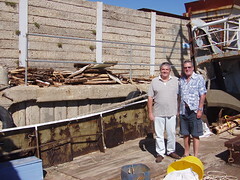 Here John (left) and Malcolm, a son and father-in-law team, 'supervise' the removal of the last of the wood off of my deck. Both Malcolm and John are retired and have offered to help. I need all the help I can get, though I'm sure they have no idea what they have let themselves in for. This weekend just gone was a holiday weekend here in the UK so, although a lot got done on Lady Jane, I also had a several friends drop by for a visit. Here Pat puts my new workbench through rigourous and exhaustive testing. No chance of any painting getting done then. I blame the wonderful weather and the effects of lunch at the Castle In the Air for a distinct lack of progress yesterday. 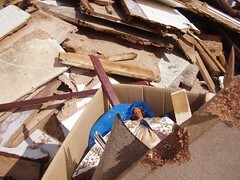 Cleaning out what was the crew quarters, henceforth to be known as the stern accomodation, I finally decided to bin the doll. Said to represent St Jude - The patron saint of hopeless causes. Yes Kate it really has gone, or will go when I dump the next load from the boat. My thinking is that the boat is no longer called Jude and the damn doll has not been contributing to the project. Ok, so Lady Jane won't be welcome in Belgium without it - Pah I say. Besides, I'm a grown man and don't play with dolls. 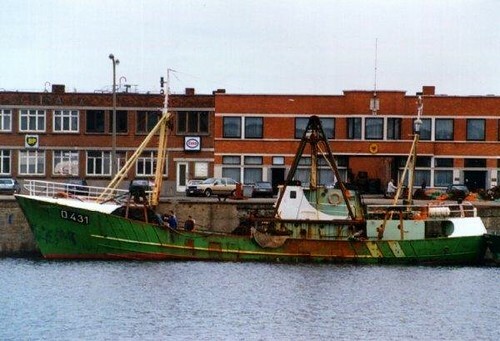 Here she is, Lady Jane or O 431 as she was known then. This, and a link to a few other pictures was sent to me by Klaas Koornstra in the Netherlands. The link is to a Dutch shipping data website. 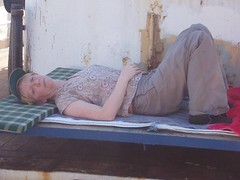 Lady Jane's page is here: www.shipdata.nl (Scroll down for thumbnails of more pictures). Klaas found my blog when searching for an Industrie engine for his boat. Of Lady Jane's Industrie engine Klaas says "this engine and brand is known as the best marine engine in the world in the 60ties and 70ties. Unfortunately they made their engines so well that, once they bought such an engine, owners sailed forever, without ordering a new one. This is the reason why the company went bankrupt in 1977." Thanks Klaas. The new information is really appreciated. 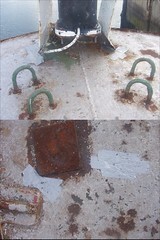 It also explains the green I find underneath the blue paint on the hull. 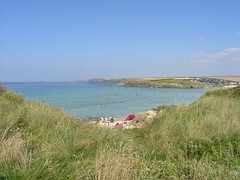 I've been down in Cornwall in a little place called Harlyn Sands, near Padstow, for a much needed break. The picture shows part of the wonderful beach we spent most of our time at, which was a conveniently short walk from where we were staying. We had brilliant weather and a really great time. Normal posting will resume tomorrow. 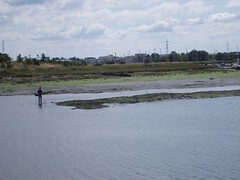 There are often people fishing on Fareham Creek, by the golf course, opposite Lady Jane. This guy must have been so engrossed in his fishing that he got caught out by the rising tide. No danger, except to his pride and maybe his shoes, socks and jeans. 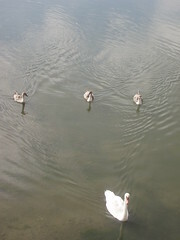 Mildred and her three cygnets came around for a visit, looking for food I'm sure. Later on I saw George with them as well, so all the muddy swans are just fine. If you click on the picture and look closely, dib and dob were swimming around with one leg stuck out behind their backs. Presumably they are just too cool to use both legs for the trivial task of paddling about behind mum. The muddy swans usually hang out by the slipway, across the way from Lady Jane. I suppose there are more people there with hand outs for them. They still sleep on the platform in front of Lady Jane at night as George, who must have been on guard, surprised me with much loud hissing when I got back from the pub the other night. Well that's it, the last of the rust has been stripped from Lady Jane's back deck. I know it doesn't look so good at the moment, but this is a vast improvement on how things were. This last section ended up being rustier than I originally thought, so took quite a bit of time to finish. I also spent some time on parts of the side walls, where practical. Now all the crusty old rust has been removed from under the paint, I'll be able to clean up the metal with a wire brush attachment on my angle grinder, then give the deck a much needed coat of Rustroy before the rust takes hold again. Before starting to paint I'll have to deal with the holes I've got on deck. What can I say? It's been another lazy day on Lady Jane. Here's Hazel, an old friend of mine, sitting on deck and soaking up the sun, after a pleasant lunch at the pub just down the road. I will get down to some serious work soon - promise. I took a break from working on Lady Jane, and visited the Odiham Fire Show, which is held annually around about this time. The show featured fire engines from horse drawn cart times right through to the modern, high tech, fire engines of today. Really interesting and well worth a visit for anyone interested in stuff. When I get the time I'll post more pictures into Flickr. 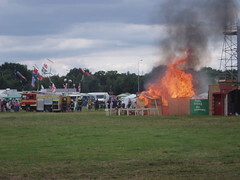 The picture shows a shack burning furiously while a fire crew prepares to tackle the blaze. To be honest I think the shack had pretty much burnt itself out before any serious water was sprayed on it. I was told that the proper, local, fire brigade were standing by, just in case. It was a really great day, probably greatly assisted by our proximity to the beer tent and hog roast. UPDATE: ok, more Odiham fire show pictures have been uploaded. If it's supposed to move and doesn't, use WD40. If it's not supposed to move and does, use duct tape. A quote from The Duct Tape Guys which I firmly endorse. Surprisingly, it seems the guys have written seven books on the subject. It's a guy thing I know, but then where would we be without the stuff? Here I've used duct tape to temporarily seal the holes I now have on my rear deck. An unfortunate by-product of rust busting sessions in the last few weeks. What happens is I make holes when cleaning away patches of rust which go right through the steel deck. I reckon if it's good enough for NASA to use when repairing Discovery recently, it's good enough for Lady Jane. These holes will need repairing before I can start priming and painting the back deck. That, in turn, will mean taking the ceiling panels out from the galley below so we can cut and weld safely. 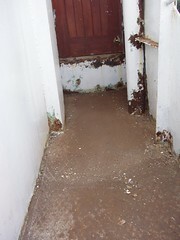 A pity really, as I'd hoped to keep the galley in a pretty good state of repair. It seems I'm exposing problems faster than Robin can help me get them fixed, as work on repairing the bulkhead is still ongoing. Good weather has meant I've made progress on the painting the rear deck project. I've almost completely finished attacking the rust and loose paint with my air hammer. To be honest I was not expecting to get as much done, though by 5.00 the noise and vibration was starting to get to me so I opted to quit. I bet the neighbors were pleased as well. A few more hours should see the final bits of the rear deck dealt with using the air hammer, and any odd bits that I've missed gone over again. There is some welding that will need to be done before I can prep and prime the deck, but I'm hoping it will not be too much of an issue. Progress on Lady Jane has been steady, but dull I'm afraid. I have painted the workbench, using Hammerite. I must say I'm pleasantly surprised by how fast it dries. The whole bench has had two coats, a process I thought would take much longer than it did. Unusual for me that. The painting has reminded me that I need to crack on and finish some of my other painting projects, if the weather will co-operate. Once again my deck is strewn with wood, hacked from the aft accommodation space. 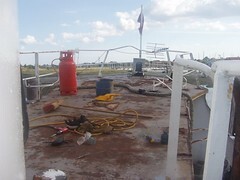 Once all the wood is out and has been taken away I can start of the job of attacking the rusty areas before insulating the hull and starting to fit new paneling. 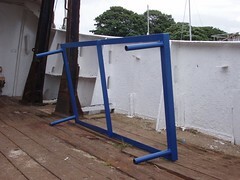 There are one or two places where the rust is really thick and, given what's happened with my forward starboard fuel tank, I must say I'm a little worried about what I'll find under all that rust. What I will probably do is get some hull thickness readings taken in those spots before going much further, just to be sure. The pile of wood on deck would have been bigger, but I was so tired that by the end of the day I could hardly hoist a pint of beer to my lips.